A clastic sedimentary rock composed of silt-size grains. 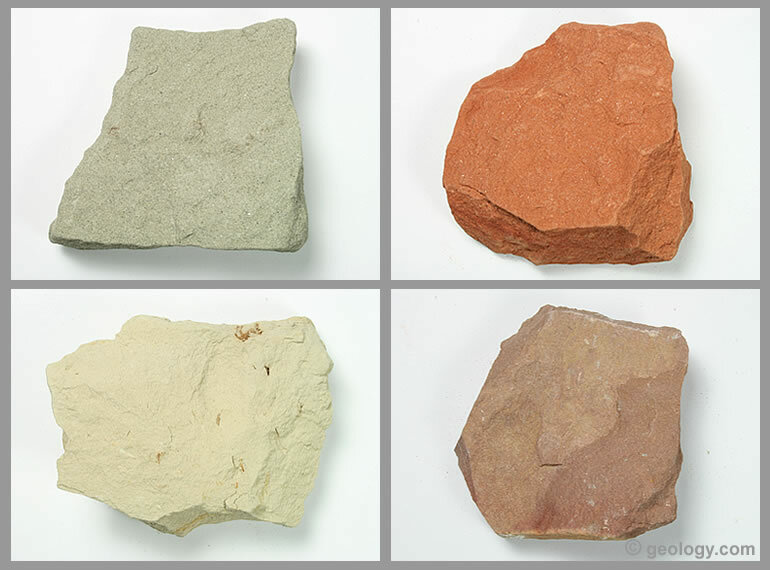 Siltstone Colors: Siltstone occurs in a wide variety of colors. It is usually gray, brown, or reddish brown. It can also be white, yellow, green, red, purple, orange, black, and other colors. The colors are a response to the composition of the grains, the composition of the cement, or stains from subsurface waters. Specimens in the photo are about two inches across. Click for larger image. Silt accumulates in sedimentary basins throughout the world. It represents a level of current, wave, or wind energy between where sand and mud accumulate. These include fluvial, aeolian, tidal, coastal, lacustrine, deltaic, glacial, paludal, and shelf environments. Sedimentary structures such as layering, cross-bedding, ripple marks, erosional contacts, and fossils provide evidence of these environments. Siltstone is much less common than sandstone and shale. The rock units are usually thinner and less extensive. Only rarely is one notable enough to merit a stratigraphic name. The word "silt" does not refer to a specific substance. Instead, it is a word used for loose granular particles in a specific size range. Silt-sized particles range between 0.00015 and 0.0025 inches in diameter, or between 0.0039 and 0.063 millimeters in diameter. They are intermediate in size between coarse clay on the small side and fine sand on the large side. Silt does not have a definite composition. It is usually a mixture of clay minerals, micas, feldspars, and quartz. The small-size fraction of silt is mostly clay. The coarse-size fraction is mostly grains of feldspar and quartz. Siltstone Outcrop: An exposure of the Holtzclaw siltstone near Louisville, Kentucky. It shows the thinly bedded and differentially weathered character of the rock unit. Siltstones are rarely of sufficient thickness or lateral persistence to merit a stratigraphic name. Public domain photo by John Knouse. Siltstone occurs in a wide range of colors. It is usually gray, brown, or reddish brown. White, yellow, green, red, purple, orange, black, and other colors occur. The color is caused by the composition of the grains, the composition of the cement that binds them together, and stains produced by contact with subsurface waters. Siltstone can be difficult to identify in the field without close examination. Weathered surfaces often appear to show sedimentary structures where none are present. Different layers weather at different rates. Siltstone is often interbedded with other lithologies. Identification requires breaking off a small piece and observing the grain size. Scraping the surface with a nail or knife blade will dislodge tiny silt grains instead of dislodging sand grains or producing a white effervescent powder. Siltstone has very few uses. It is rarely the target of mining for use as a construction material or manufacturing feedstock. The intergranular pore spaces in siltstone are too small for it to serve as a good aquifer. It is rarely porous enough or extensive enough to serve as an oil or gas reservoir. Its main use is as a low-quality fill when better materials are not locally available.